QUEEN'S Birthday was spent in the winners circle for Wingrove Park's Joe & Daira Vella who celebrated an impressive debut win from the Mick Kent trained Greyworm (Master of Design x Miracle Magic). The three-year-old led from barrier to box around the Mornington course and lived up to the hype of his recent trials. Greyworm is raced in partnership with Eden Lodge's Gary Lui. Wingrove Park's Joseph Vella predicts a big future for the precocious gelding who was ridden by Ethan Brown to a comfortable 1 3/4 length win. 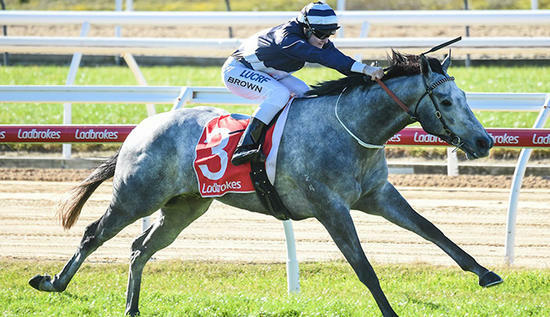 "Greyworm handled the raceday experience very well and showed great speed and fighting qualities to win well - we have no doubt this horse can measure up to metropolitan company and go black-type," an enthusiastic Wingrove Park CEO explained.